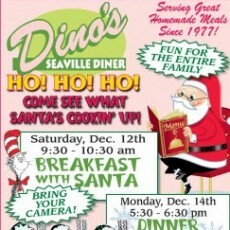 Santa is coming to Dino's so come see what Santa is cooking up! Breakfast with Santa is December 13th from 9:30am-10:30am. We'll also be hosting a dinner with Santa on Monday December 14th from 5:30-6:30pm. Don't forget your appetites & camera! Family owned and operated, we're open 7 days a week from 6:30am, serving breakfast, lunch and dinner. We specialize in seafood, straight from the docks of Cape May. We have the area largest Kid's Menu and breakfast is served all day.